Earn your turns during 3 days of intensive guided ski touring in the Chamonix Valley. The structure of the days will depend on your abilities and aspirations, whether your setting your first skin track or looking to ski some steeper lines with the confidence of a guide for company, this trip is a sure fire way to get away from the crowds and to the hidden gems that escape the skiers in resort. It is common to combine it with a few days personal skiing beforehand. You will also spend time learning or refreshing your backcountry skills such as terrain evaluation, the use of transceiver, shovel and probe, and other skills essential to off piste safety. Prices are reduced for groups between 2-6 people. Earn your turns during 5 days of intensive guided ski touring in the Chamonix Valley. The structure of the days will depend on your abilities and aspirations, whether your setting your first skin track or looking to ski some steeper lines with the confidence of a guide for company, this trip is a sure fire way to get away from the crowds and to the hidden gems that escape the skiers in resort. The glaciated valleys that hang above Chamonix offer superb skiing in a wild environment. We build up our confidence over the week often descending the infamous Vallee Blanche and Col du Passon, culminating in an overnight tour to a mountain refuge. You will also spend time learning or refreshing your backcountry skills such as terrain evaluation, the use of transceiver, shovel and probe, and other skills essential to off piste safety. Prices are reduced for groups between 2-6 people. Learn how to access the inaccessible in winter during 6 days of varied and engaging ski mountaineering. You will spend the week developing an arsenal of skills that are key to moving quickly and efficiently over a variety of terrain. The combination of ski touring and mixed climbing opens up corners of the alps that few people get to experience. We will spend our time in the high mountains often on the glaciated terrain that hangs above Chamonix Valley, using mountain refuges when appropriate. This demanding course requires a high level of fitness and you should be comfortable skiing off piste in variety of snow conditions with a heavy pack(7-10kg) to get the most out of the week. 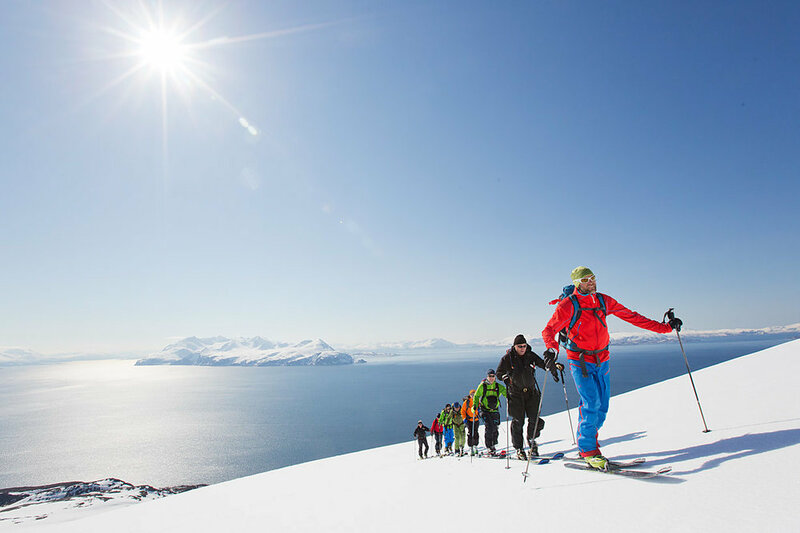 Skiing from a summit to the sea is an unforgettable experience. The wild peaks that thatch the Lyngen Alps offer a wide variety of easy summit tours, technical traverses and steep couloirs. The pace of life is slow, the food fantastic and mountains host enough skiing for many years. To get the most out of this trip you need to be comfortable skiing offpiste in a variety of conditions as well as feel fit enough to ski tour 1000m+/- a day as there a no lifts around here!